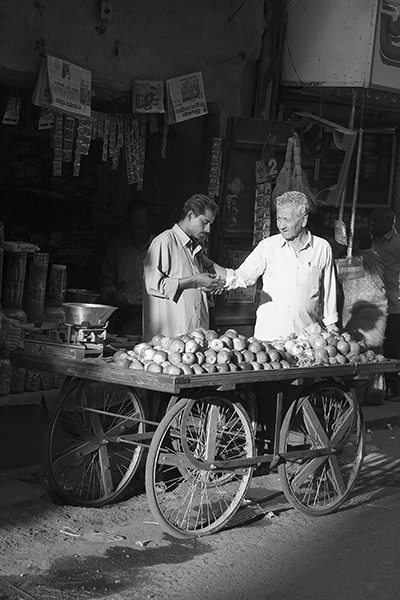 In Jodhpur, India in 2006 I was in my favorite market street with my Canon dSLR. Among the many images recorded that day was this one. I was taken by the fact that this single image seemed to symbolize where India was (and still is, I’d venture) – between two views of itself, between two worlds. 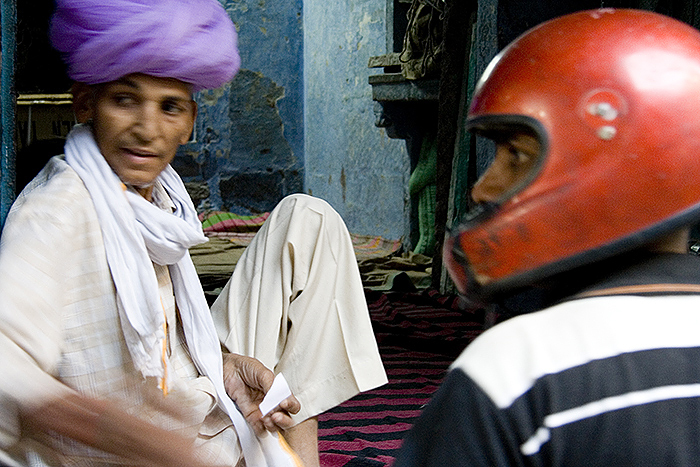 Traditional India in a purple turban, looking back through millennia and India in a red motorcycle helmet, rushing into the 21st-Century. Because the image was made in haste, the focus is on the middle and distance and not on the men, as it should have been. As it is far from technically perfect, I’ve never made it available in my studio. The other day, in the middle of a major cleaning project in my home office/studio, I came across it. Darn, I still like it and so, decided share it with you here and now. You can see more images from my Indian trips here on my website, http://www.annbrooks.net or in my studio at Art Works Downtown in San Rafael, California. One of my images, “Rajasthani Hanki” was juried into the current exhibition in the Art Works Downtown gallery, “New Avenues: digitally influenced art”. Yes, I know, I don’t usually photoshop my photography, but I sure had fun with this one. From my notes about the image: “Rajasthani Hanki” was created in Photoshop using over 100 layers of carefully chosen details from digital images I made in the cities of Jaipur and Jodhpur in India’s state of Rajasthan. Rajasthan is in northwest India which abuts Pakistan on it’s western border. Historically the state has been composed of a number smaller principalities which were united into what became the largest of India’s states at the time of Independence in 1947. Prior to statehood, the major principality in Rajasthan was the city of Jaipur (2.3 million population today) , which became the state’s capital. Another, smaller, sister principality was the city of Jodhpur, population close to one million today. In this piece, the central image is that of a young woman selling posters of sacred Hindu imagery along a major market street in Jodhpur. This is surrounded by lacy balcony details from City Palace in Jaipur. 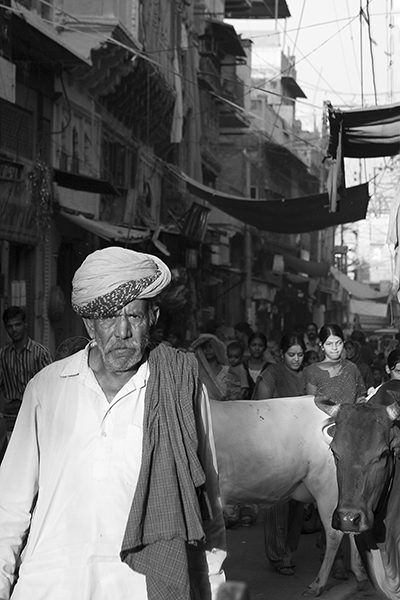 Next are a series of women in the picturesque, walled Old Market in central Jodhpur. The remaining, lacy effects which complete the ‘hanki”, are of a variety of architectural details from various palaces in “Pink City” of Jaipur. To summarize, photos of the women are all from Jodhpur. All architectural details are form royal palaces in Jaipur. Cultural note: Marin County and internationally acclaimed Indian musician, the late Ali Akbar Kahn was court musician to the palace in Jodhpur for several years prior to Indian Independence. Jodhpur photo honors and signs of rapid change in India. Over the Fourth of July weekend Marin County, California holds it’s annual County Fair, reputed to be one of the best in the country for it’s Fine Arts exhibitions. So, this year you can imagine how pleased I was when one of my images was chosen “Best in Class” for Monochromatic Photography. Recently, over several years, I had spent about two weeks each in Jodhpur, in the state of Rajasthan in India. I was doing a still photography documentary about a Muslim girl who wanted to become a doctor and had great support from her family. The other thing I always looked forward to in Jodhpur, was photographing in the vibrant streets, and markets in this small, ancient Indian city. I had found that about 5 p.m. each afternoon the light came streaming through the city’s major market street and was often magnificent. It was in this street, at that hour that I took the three black and white photos in this post. 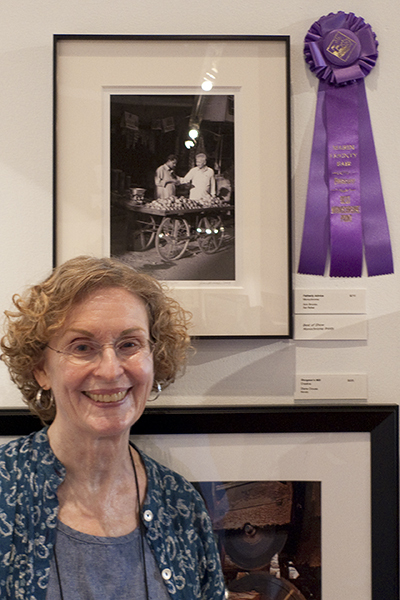 The one to the right has been an award winner several times, including this year’s county fair. Below are two others in that series. The year after I took the one with the man and the cows, I marveled that the same small street was a totally different scene – lots of motorcycles and motor scooters and no cows in site – signs of very recent prosperity! 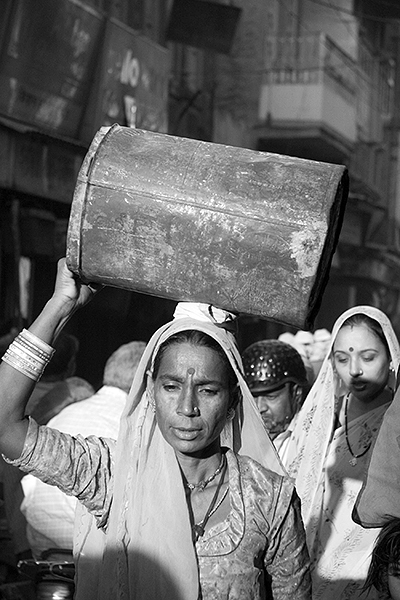 On the right below, is a woman carrying her groceries in that 5-gallon can on her head, something else that was nowhere to be seen as prosperity took over in subsequent years. Yes, prosperity is bringing large, rapid changes to many parts of India. It is growing harder to find “the old India”. Technical notes: Photos were taken with my first digital SLR, a Canon Rebel XT, and the 17-85mm f/4-5.6 IS lens that I still use on my Canon 40D today. The images were then converted from color to black & white in Photoshop.